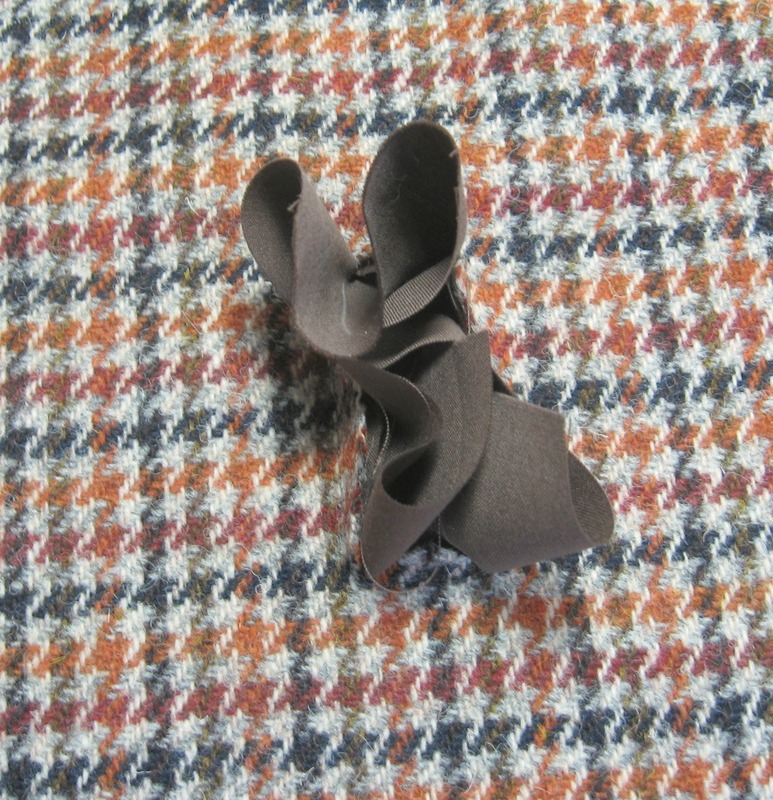 Buttonholes and pocket openings part one……..
I’ve just finished sewing a second coat for Ruby (she’s a beautiful russet coloured King Charles Spaniel, so this autumn coloured Harris Tweed really looks gorgeous on her). When she goes on her walks and strolls, she wears a harness, so when making her coat I made sure to include an opening for her lead to clip onto her harness. Firstly, mark out the size of the opening, I’ve drawn it on some light weight wool suiting which I’ve also used to line Ruby’s coat. The opening for her coat is about 2 1/2 inches long by 1 inch wide. 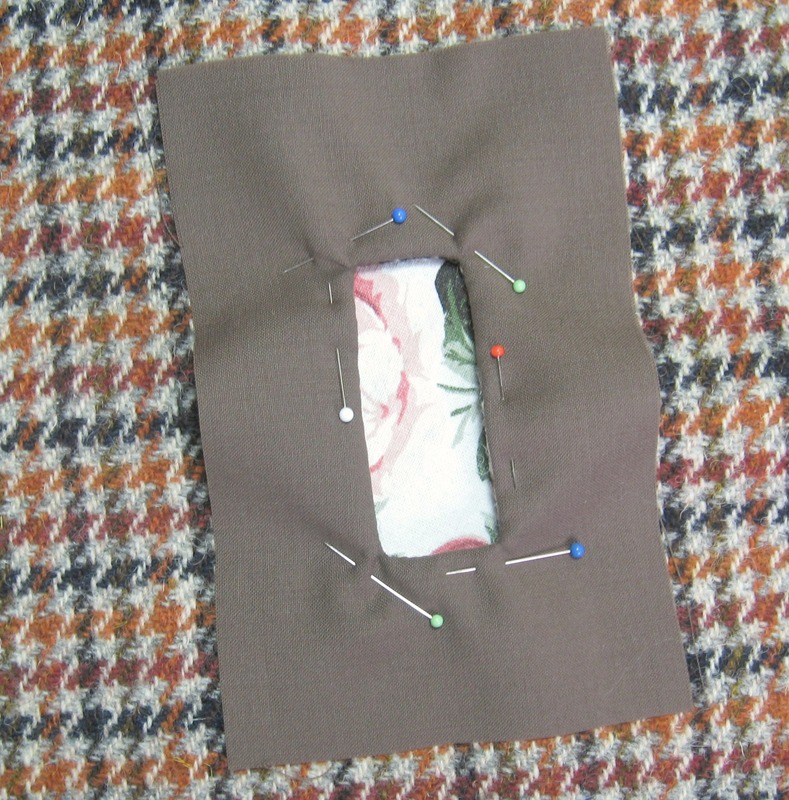 Make sure the drawn opening is exactly where you want your “buttonhole” to be. Pin, and then tack in to place. 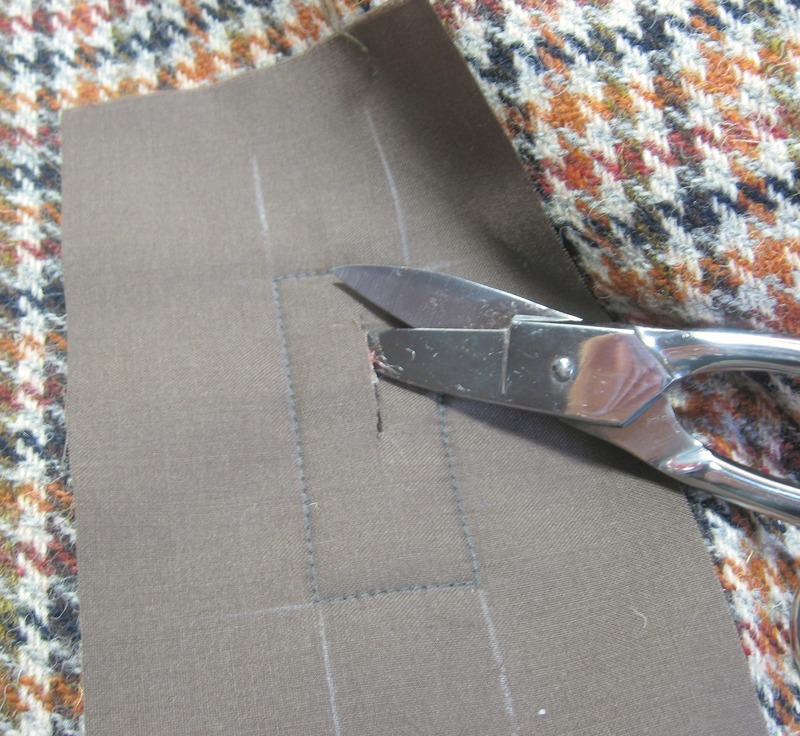 Using a sewing machine, carefully sew around the drawn line. Keep to the drawn line as steadily as possible. Continue to cut a straight line in either end of the sewn rectangle. You want to cut up to about 1/2 an inch from the end. Then carefully cut up to each corner edge, cutting as close as you can, maybe a 1/16 th of an inch away. Make sure you do not cut right through the stitches. 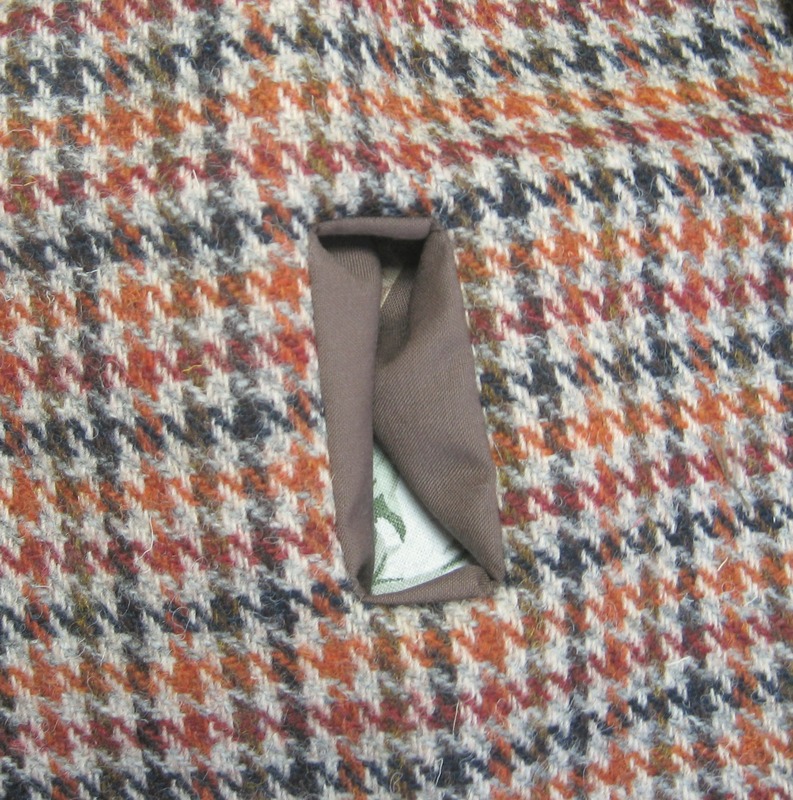 Once the fabric is all pushed through the hole it looks a bit more like a buttonhole or pocket opening. From the back it’ll be all messy, gently flatten it out with your fingers. 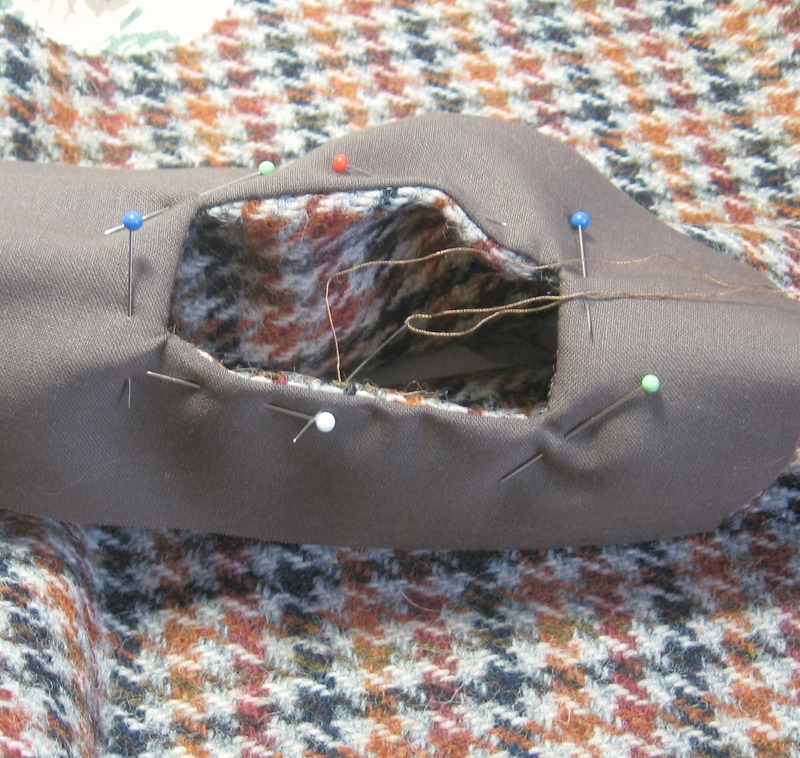 Smooth out the fabric and carefully pin it. I prefer to pin it quite close to the seam as that way when I sew it into place it doesn’t feel like I’m holding a hedgehog as the pins tend to prick the palm of my hand. 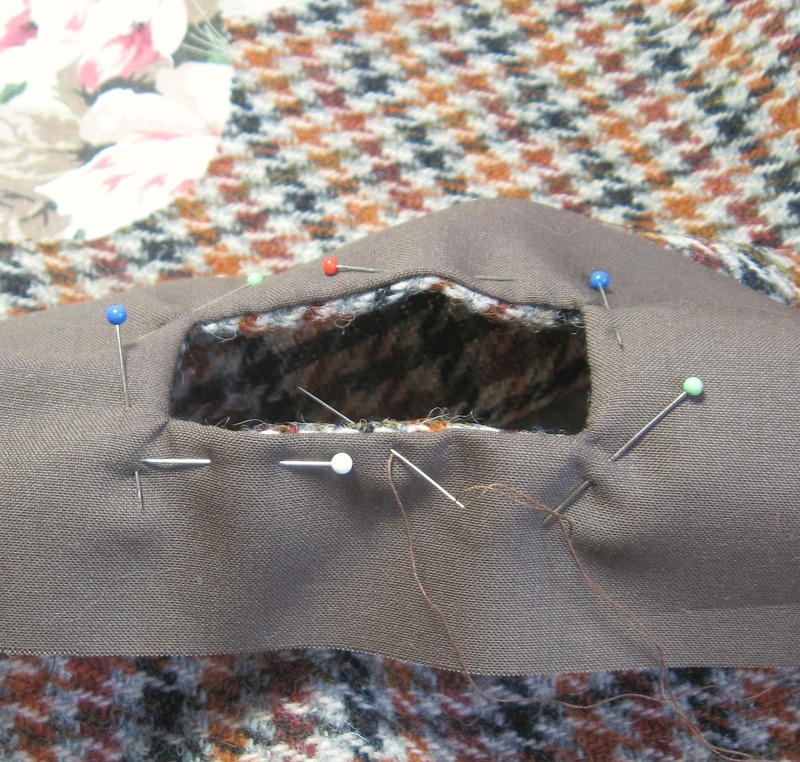 Once the fabric has been pinned flat, then from the front, the buttonhole already looks much better. 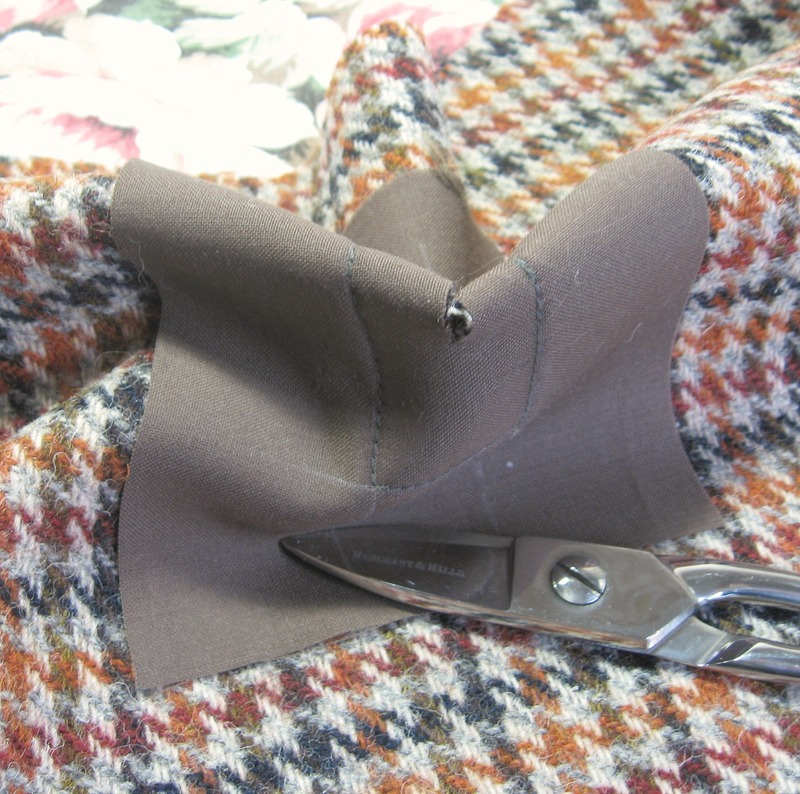 Using a very fine and sharp needle and a thread that matches as close as possible (I’ve favoured a thread that blended into the Harris tweed as the underneath of this buttonhole won’t be seen) sew a small stab stitch around the edge of the buttonhole. I use applique or “sharp” for this as they are finer and like their name, are indeed super sharp. 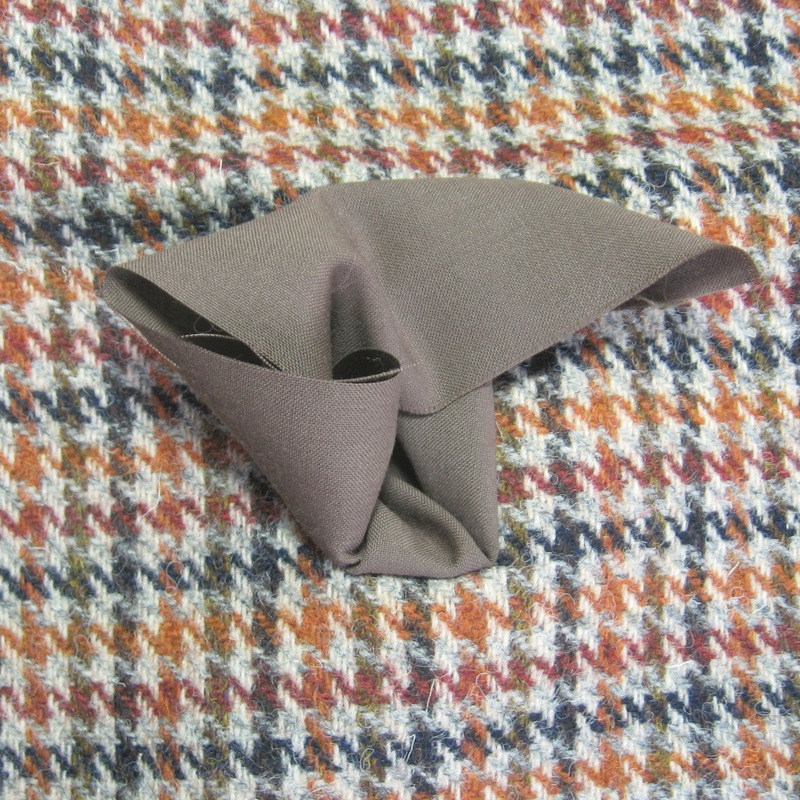 Knot the thread and sliding the needle up under the lining, bring it out near the edge of the buttonhole. Insert it through the two layers of fabric and push the needle through. 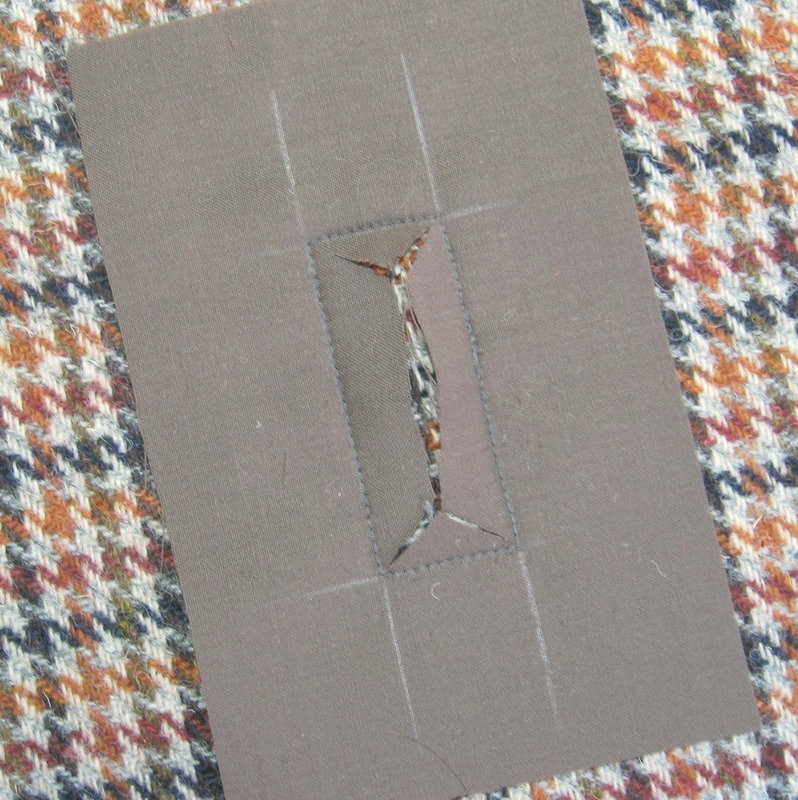 Then working to the right, make a tiny stitch in the tweed before pushing the needle all the way through slightly on the diagonal to the left side. When you bring the needle out through the lining, make a tiny stitch over to the right before inserting the needle upwards with a diagonal slant to the left. The finished opening looks like this. From the back it looks like this. Ruby’s coat is lined so this doesn’t get seen but is all hidden away in the coats construction. A few Christmases ago, my Arpette bought me what was one of my all time favourite presents ever… so lovely in fact that I burst into tears because I loved it so much, and he then had to ask “don’t you like it?” …..
…is in fact a small treasure trove of sewing delights…. absolutely jam packed and stuffed to the gills with a selection of vintage haberdasheries and tiny delights. I really felt like Howard Carter as I lifted up the lid and saw all the beautiful things inside….and then I spent ages taking everything out (and even longer trying to fit everything back in). Items included a small embroidered silk scissor case with a pair of scissors inside (which are really sharp, with fine blades which are perfect for lifting up and un-picking stitches), tailors chalk, vintage sewing threads in a variety of colours, embroidery silk, a bakelite crochet thread holder, a small green container, the creamy yellow thing in the top left corner is a Pin Ejector made by Taylor’s of Birmingham (you push the top down and a pin pops up out of the middle….much fun to use), a thimble, a small home-made pincushion, the wooden spindle thing at the bottom has obviously broken off something in the past and has been kept (maybe with the intention of fixing it)…..
Other items include small wooden boxes which contain their own little treasures, more sewing thread, a pin-cushion which I think has come off an old sewing machine, a tatting spindle and a card of heavy hooks and eyes. I have no idea what the blue plastic and metal thing at the bottom is…a complete mystery. Oh, it also has the world’s ugliest and most horrible to feel pin-cushion (the green and brown thing at the top right corner)….not only does it look awful, it feels nasty, it’s really resistant to pins going in (think it has sawdust inside) and if you were going to have a nightmare about sewing and haberdashery items…it would definitely be in it. 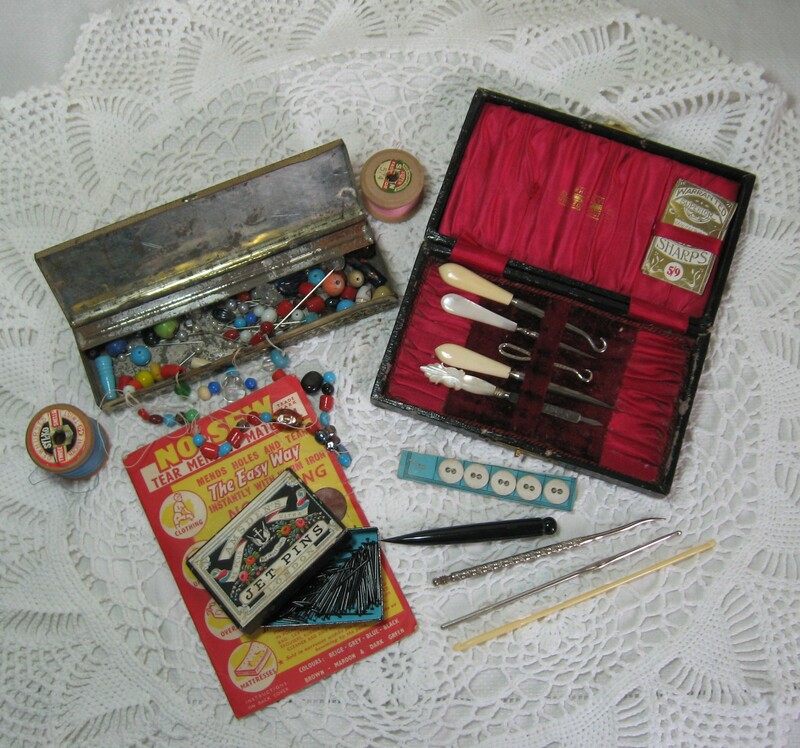 Other delights included a tin filled with glass paste beads, crochet hooks, a box of jet black pins (these are lovely to use on white fabric) more sewing thread, buttons, some pointy things (not the most technical of terms) and a beautiful little box with mother of pearl handled hooks which would have been used for lacing up boots with buttons. As I mentioned, all the small boxes opened up to reveal their own little secrets (I think this entertained me pretty much all that Christmas as I kept opening it up and looking at everything again)…. 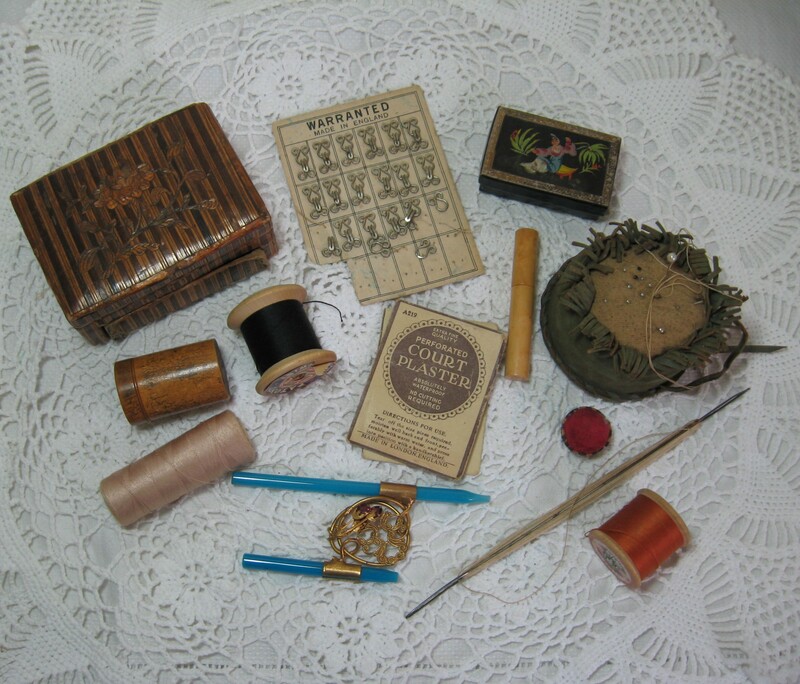 tiny spools of thread which themselves opened to reveal some needles, packets of still sharp fine needles, the most smallest mother of pearl buttons (the size of the pink of my little finger nail), and a tiny calender from 1874 which amongst other notable dates, lists the birthdays of Queen Victoria’s children. 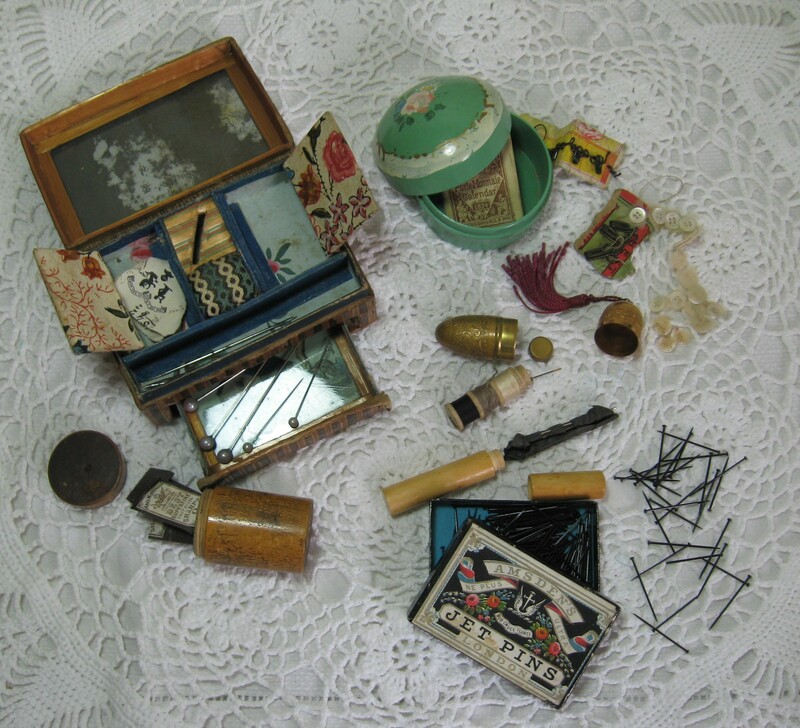 The small sewing box to the top left is most curious, it looks like it has been made from card and straw. There is a piece of glass in the lid and in the small draw which slides out. The drawers and compartments have all been decorated with painted papers, and there are some fancy pins in the bottom. 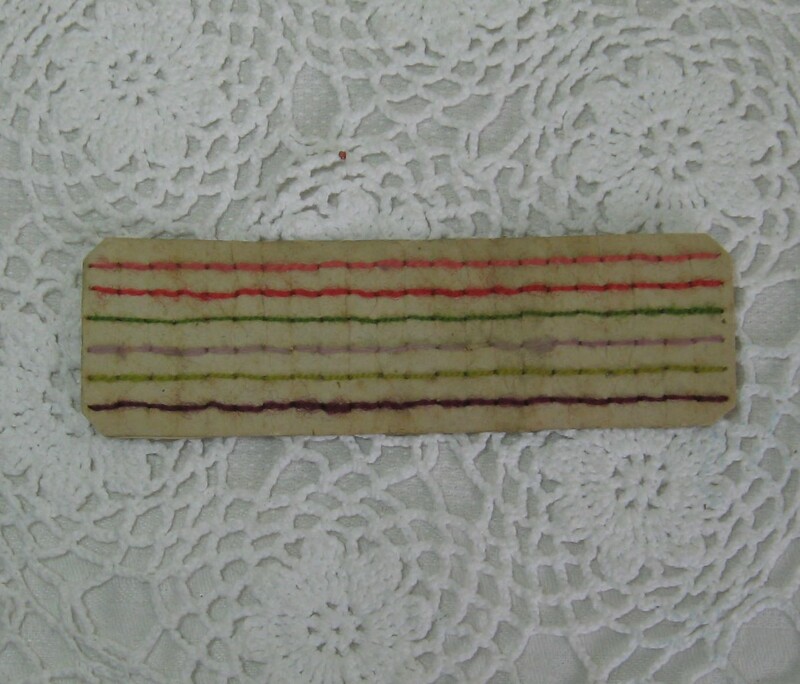 My most favourite treasure from the hoard is a piece of card that has 6 rows of coloured crewel wool stitched along it. It’s not very big , not even 6 by 2 inches. I don’t use everything from this box on a day to day basis, however I have tried to incorporate what I can into my regular sewing box. 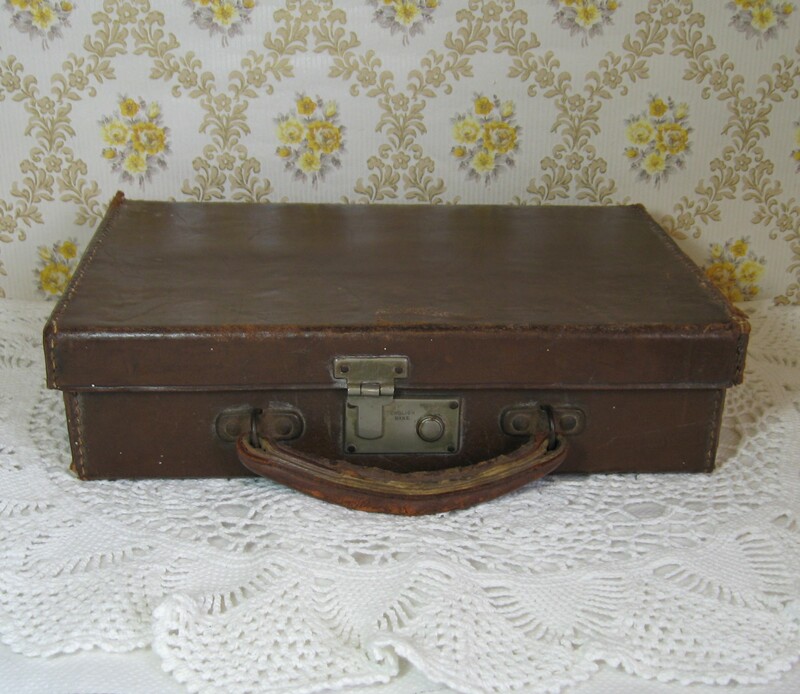 I love old sewing notions but I don’t want to have a sewing museum at home so I have no qualms about using things that maybe others would have on display. For me sewing is such a pleasure, and being able to use many of these pieces everyday just makes it even more so. 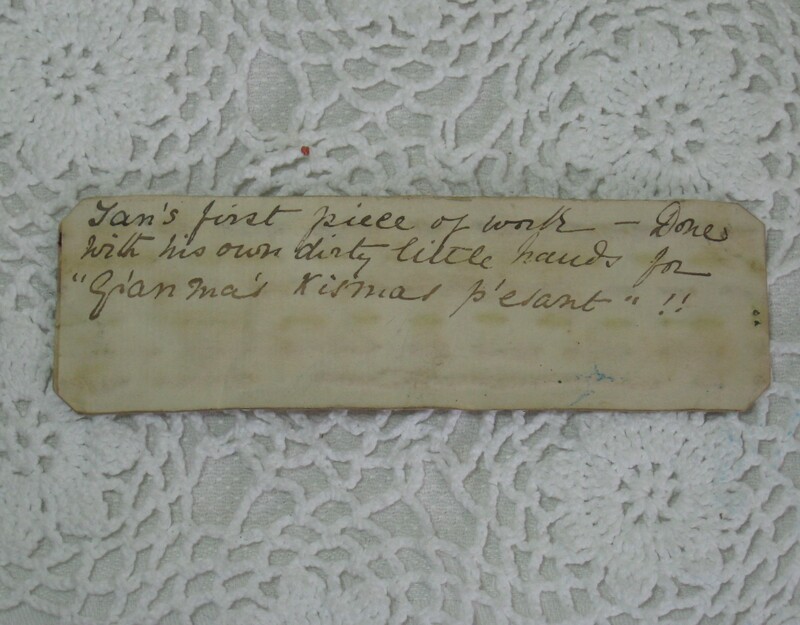 *Ian’s first piece of work – Done with his own dirty little hands for “Granma’s Kismas p’esant”!! During the holidays (which when the weather is wet and windy and utterly miserable, do feel well and truly over) I tried to catch up on all the small bits of sewing that I’d been putting off while I was sewing and making things for the craft fairs. I had a basket piled high with holey socks which were all too pretty to chop up for stuffing so spent several surprisingly pleasant afternoons darning socks using a lovely old darning mushroom (like Wagon Wheels these were definitely larger in ‘the good old days’) and a selection of darning wools and vintage crewel wool (which darned just fine) I’d also purchased the above bear before Christmas and he was in need of some repair work so re-stuffed a leg and repaired and darned some seams and holes. I still need to re-sew his nose and make him a little outfit. 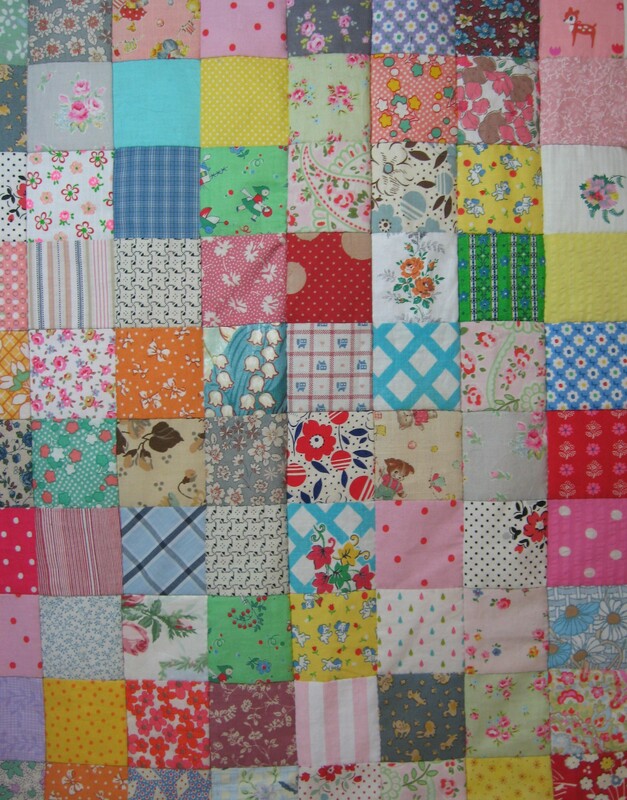 During the Summer months I had started sewing some patchwork together (small 2 1/2 inch squares) made up from a selection of fabric, it was just right to take to craft fairs as it is all sewn by hand, the pieces are small but not too tiny, so it makes a very portable project. I tend to sew the squares together in strips of 4 or 5, then join these strips together once I am then home. 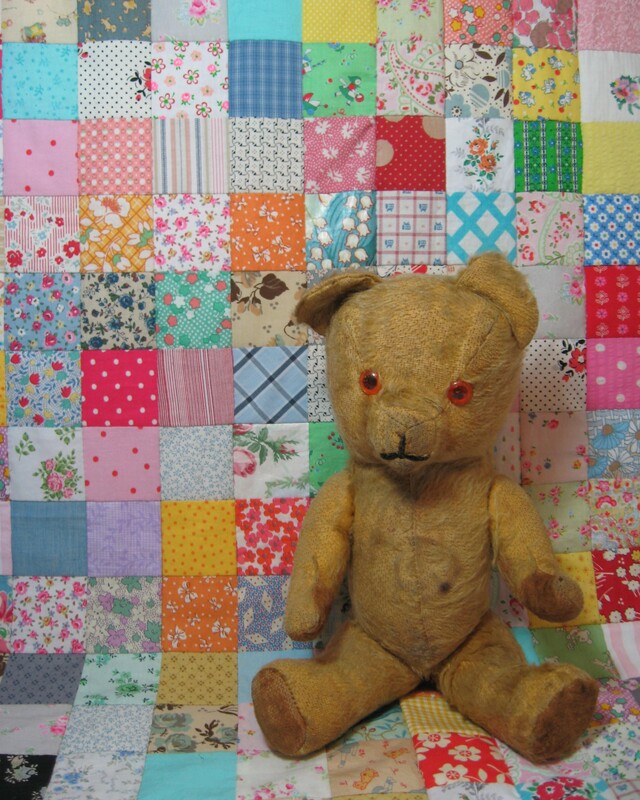 So over the holidays all the pieces were sewn together, and I’ve now got a patchwork piece 23 squares by 21. (It is just under 4 ft by 3 1/2 ft) I’ll probably make it a bit bigger as I want it for downstairs as it can get a bit chilly in the evening. 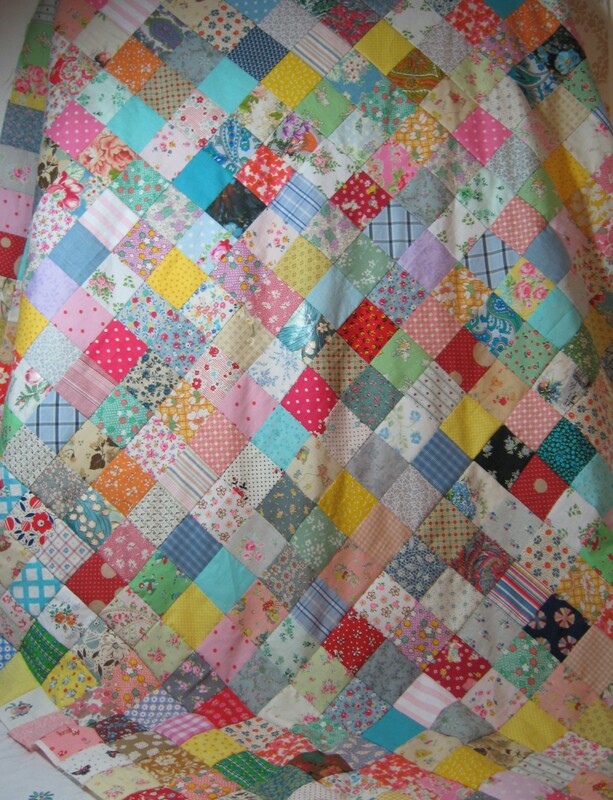 This is ideal for using up fabric from scrap bags, and has been lovely to sew. I can’t always remember what I did a couple of days ago, however looking at the patchwork I see fabric from Sylvia, pieces from Beth, a few squares of fabric from Phils shirt, and a couple of tiny squares from D-frans shirt left from sewing a quilt from Chloe which used fabric from her family and friends, fabric from Nicky, a piece from Nanny’s bed sheets (it wouldn’t feel right without using that), fabric from Sasha, pieces from Alison who taught me to quilt…… for me this is better than a photo album and is my favourite way to piece patchwork. Every so often I have to stop, sort out fabric, draw out squares and cut them out with seam allowance, then I can carry on. I do sometimes use a rotary cutter when cutting fabric, but the majority of these squares have been cut using a pair of fabric scissors. 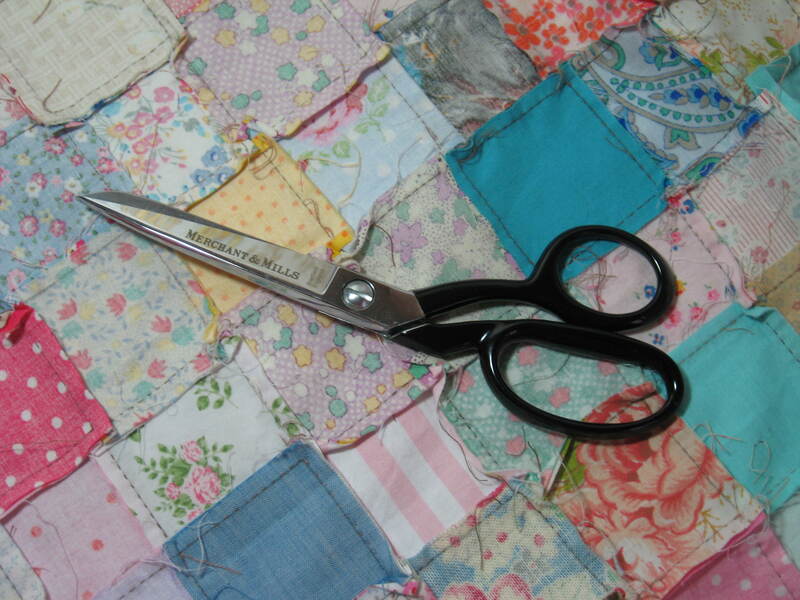 Many years a go I made the mistake of lending out a pair of lovely scissors and never got them back (it’s a mistake we all make) and have been making due with a pair that had seen better days. However I’ve had my eye on these gorgeous Merchant and Mills scissors for some time, and at Christmas I was lucky enough to unwrap a pair from Kathy and Phil. They had also bought me a pair of the Merchant and Mills buttonhole scissors which are designed for cutting buttonholes, but are equally ideal for notch cutting. Eldest sister came round on Sunday afternoon and when I showed them to her (I was very kind and even let her hold them) she admitted to experiencing Scissor Envy. When I was little I had two very different older relations that sewed…. my Great Auntie Dora, and my Nanny. They were incredibly different sewers and knitters and their sewing baskets reflected this. Auntie Dora’s was very neat and tidy, needles always in a case never in a pin cushion kind of lady. 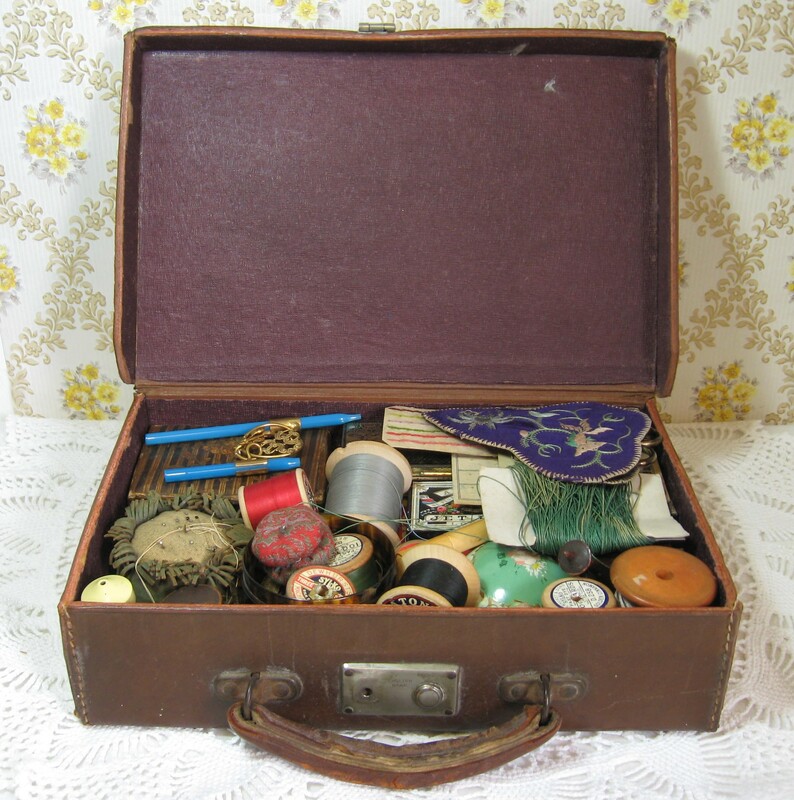 My Nanny was the complete opposite and her sewing basket was a bit of a death trap….I still remember squeezing out all the needles in her pin cushion for her, it was more prickly than a hedgehog. 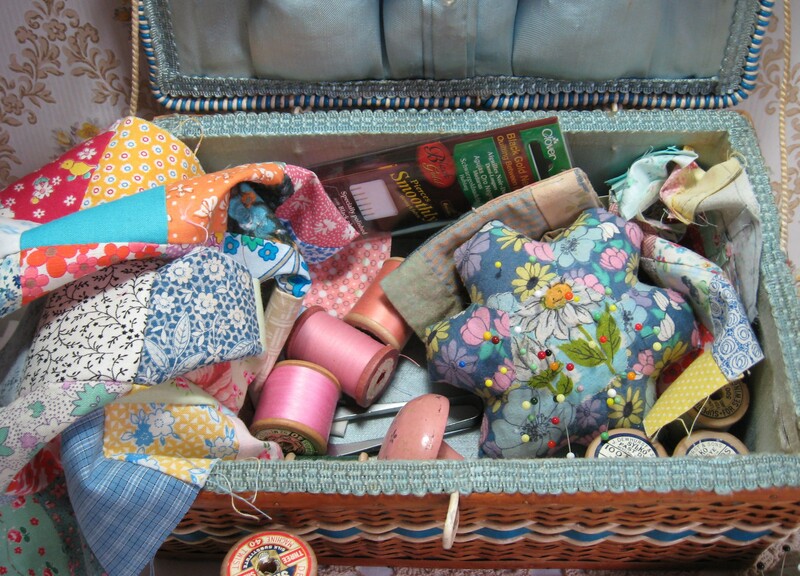 The photo above is one of my sewing baskets and you can see I do rather take after my Nanny, but I do try to make sure needles are in a case rather than in the pin-cushion. 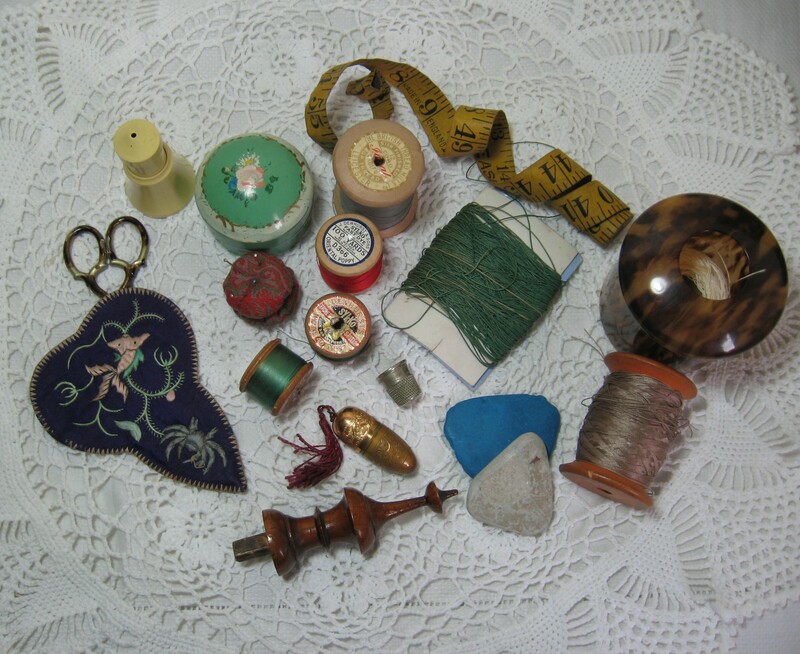 I’ve been sewing for more years now than I can remember, and over that time I do seem to have amassed quite a collection of haberdashery items. Some pieces have been inherited, other pieces have been bought for me,some times I’ve bought from a car boot and other pieces have been bought new. 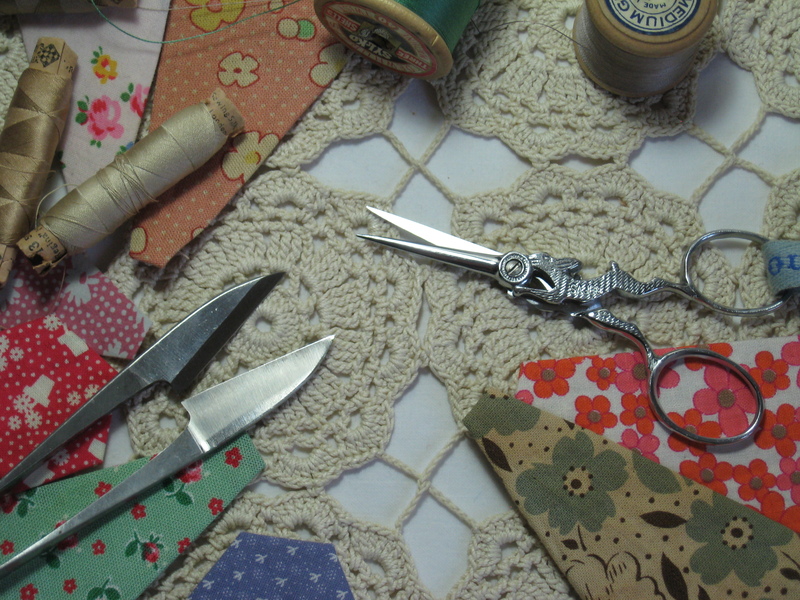 My basic sewing basket kit consists of a few pieces that I seem to use every day and just always turn to. I could sew just fine without these items, but having them makes it that much more pleasurable. 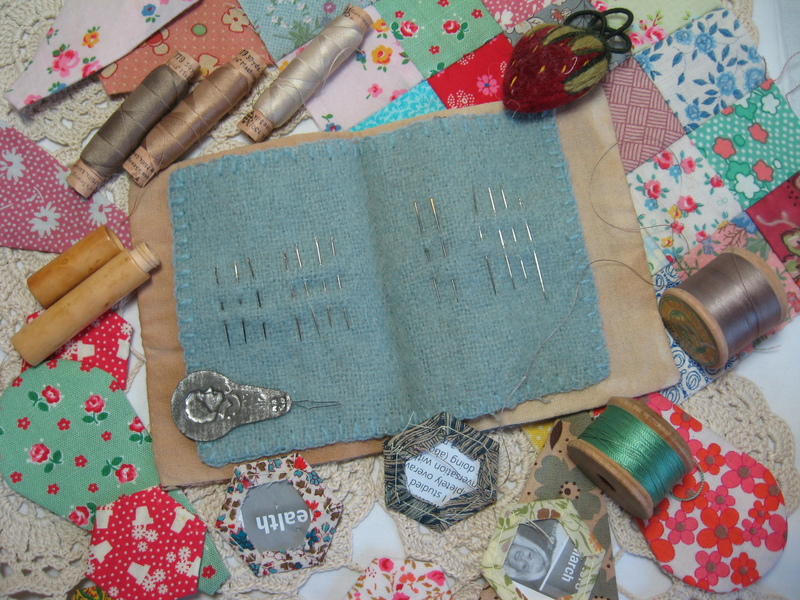 I really like using Clover Gold Eye Applique Needles, they are just brilliant for patchwork and applique. They are lovely and sharp and a packet of 15 needles is only a couple of pound. Clover also have a more fancy smancy needle range called Black Gold. 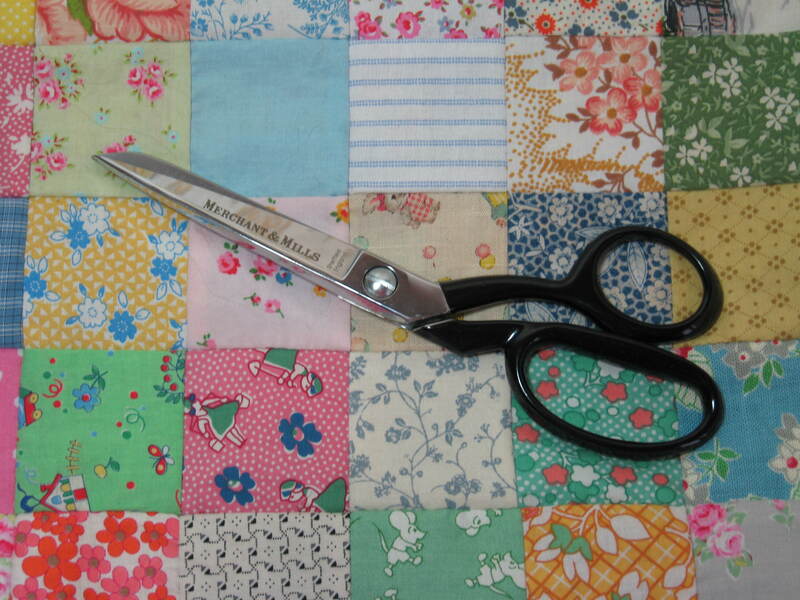 They are incredibly sharp and are brilliant for piecing patchwork especially if you are sewing really tiny pieces together but they do cost a lot more. I have also used John James and Milward brands. These are perfectly good needles but I do prefer the Clover ones. When it comes to quilting I like John James Quilting Needles in size 11 and 12. They are pretty darn tiny, measuring a scant 22 mm, but practise does help, and they aren’t very expensive. I have also used the Black Gold range of quilting needles from Clover, they’re super sharp, and are nice as a sewing treat but they do cost a lot more than the John James needles. The little velvet strawberry is a needle sharpener and is filled with emery. It is so good for keeping your needles super sharp (but don’t use the Black Gold needles in it as it will wear the black coating off the tips) I’m pretty sure it came from The Royal School of Needlework, it is all hand stitched and embroidered and is just beautiful. I bought it years ago with some birthday money from a lovely elderly lady I’ve known for over 30 years (she is like an extra Grandma or Nanny). Every time I use it I think of her. I never thought I would need to need to use a needle threader but when I am using very fine thread and needles with tiny little eyes then this little threader comes out. I think this one came from a box of sewing bits I bought from a car boot.